GVT, Gates Viewer & Trace, is a netlist debugger that provides advanced netlist tracing and debug features. The tool supports Linux 64bits OS. Download the release package and unzip to a directory. Set 'the_64bit_install_path/GVT64/bin' in search path. Contact support@nandigits.com for evaluation license, if the evaluation netlist size is larger than 10M bytes. There are two license modes, fixed node mode and floating node mode. Fixed node license: Copy the license file to "the_install_path/GVT64/bin" and restart GVT. When GVT is run without '-run' and '-shell' option, it goes into GUI mode. GofViewer is the first window after GVT starts up GUI interface. Users can input netlist files and design files through the Load Design command. If any netlist file or design file has been updated during GVT session, this command can be used to reload the design. This command loads another netlist file to create a new hierarchical tree. The hierarchy tree is listed in the hierarchy list window. The command is useful when users want to draw circuits from different netlist file on the same schematic which is good for logic comparison in netlist debug scenario such as LEC failures analysis. The command opens log file in a text window. This command searches for the matching string in the netlist text window. GVT loads only one module in the netlist text window when the netlist file is hierarchical with multiple modules. The command loads the corresponding module into the text window and highlight the line with the specific number in the netlist file. This command reports the design area. The command requires standard library files to be loaded which include leaf cell area information. This command reports the leakage power in the design. Same as the Report Area command it requires standard libraries. This command reports the leaf cell type and numbers in the design. This command reports the hierarchical sub-modules in the design. This command reports the statistic of the current design. It pops up an option window for interactivity from users. The command lists the libraries and leaf cells in each library. This command pops up an entry window for users to input leaf cell name string, wild card can be accepted. All leaf cells matching the string is listed. If there is only one cell matched, the detail property is listed. This command launches GofTrace Schematic, if any instance or net string is highlighted in the netlist window, the instance or the driver of the net is drawn on the schematic. Otherwise, the schematic is empty. This command pops up an entry window for users to input a string to load a specific instance. For example, ‘u_abc/U123’. Click ‘OK’ button on the pop window, GofTrace Schematic is launched. This command launches Layout Viewer window, if any instance or net string is highlighted in the netlist window, the instance or the driver of the net is highlighted on the Layout Viewer window. The command requires that physical files to be loaded. Both def and lef files should be loaded before launching Layout Viewer, otherwise a warning window pops up for the missing physical files. This command launches GofCall window to run scripts or other interactive command. This command exits GUI mode and switches to shell mode. It has ‘GVT >’ shell interface in shell mode. This command group processes Spare cells in metal ECO. Warning! GUI metal ECO is used for visually checking the possibility of metal ECO. The script mode metal ECO is recommended. This command extracts spare cells from netlist file. A pop window appears for spare gates pattern. The default is ‘spare_*/*’. Click 'OK' to extract spare instances from the netlist, and a pop text window appears to list all spare gate instances. Save the list to a spare list file for later usage. This command loads in the spare cells file created by the above command. This command launches netlist files compare window. The netlist compare function can do more than simple Linux ‘diff’ command. This command processes Prime Time report file. Read this PDF file for the use case. This command group processes SDF file for delay information interactivity. GVT reads in SDF Index File instead of SDF file itself, since SDF can have huge size. Once the index file is created it can be reused next time and loaded in much faster. This command loads in already created SDF Index File. Increase font size in the hierarchy list window. Decrease font size in the hierarchy list window. Increase the font size in netlist window. Decrease font size in netlist window. An option window pops up for users to choose which dump restore file to be saved. It’s useful for netlist simulation debug. When one format box is checked in pop menu, ‘Write Waveform Restore File’ item is presented on the top when one net is selected in the netlist window. Integration of various setup information. About GVT, Gates Viewer & Trace. Visit the website for this manual. Read out MAC address. When users decide to purchase licenses or ask for evaluation licenses, MAC address is required to generate GVT licenses. Press key ‘Alt’ and underlined letter in menu. 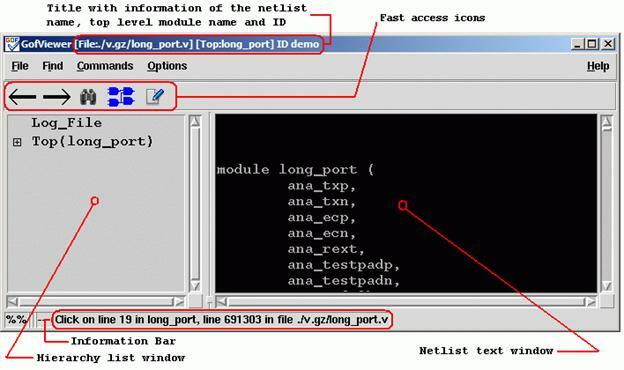 Click mouse-left-button on netlist text window, the object which can be net, instance or module under the cursor is highlighted. Netlist window pop menu has different content according to the selection status. Pressing keys Ctrl-a can have all content in the netlist window selected. Press mouse-left-button and don’t release, move mouse down to select multiple lines. Click mouse-right-button and release, a pop menu appears under the cursor. The menu content varies with the selection status in the netlist window. Search for a string in the netlist window. Keyboard shortcut is Ctrl-f. Copy the selected object (net or instance) to new schematic window or existing schematic window. Copy the selected object to a new schematic. Copy the selected object to an existing schematic window. Trace to the driver of the selected net. The netlist window shows the instance that drives the net and mark the driven net. Pop up a window to list the connectivity of the selected net. Pop up a window to list the fanin endpoints including flops and input ports that drive the selected net. Pop up a window to list the fanout endpoints including flops and output ports that are driven by the selected net. Go to the definition location of the parent module calling the current module. It’s only active in sub-modules, not in root top level module. List the context of the selected object which can be net, instance or module. Click mouse-right-button and release, a pop menu appears under the cursor. The menu content varies with the selection status in the hierarchy window. Open the module content and display it in the netlist window. Open the parent module and highlight the instantiation location. Edit the module by using edit tool defined in menu Options->Setup->Misc->’Edit tool’. It asks for a directory for storing temporary files. After editing, the edited modules can be saved into a file. GofTrace is an incremental schematic engine. Users control how to expand the schematic by clicking the input/output pins of gates with mouse-middle-button. Users can adjust the positions of the gates on the schematic any time by mouse-left-button. Mouse left button is used to select object. Click on any object, it is highlighted to indicated being selected. Press 'ctrl' key and click on objects to select multiple objects. Press mouse left button and move the mouse to select multiple objects at one time. Mouse middle button is used to trace the schematic. Click on input/output pins to expand the schematic. It used to do drag-drop function as well. In ECO mode, it's used to connect floating input pin to existing nets. Mouse right button is to popup menu. Save the schematic to a file for future usage. The saved file has extension ‘.st’ which can only be used by GVT in ‘Open’ schematic command shown below. Open schematic stored by Save command above. Print schematic to a printer or file. Printer Page Setup window pops up for the print scope setup. In Windows platform, users can select one of the printers configured in the system. In Linux platform, make sure ‘lpr’ command works. This command launches a new GofTrace schematic window. This command pops up a window for user to enter a string into the entry to find the matching instances. It accepts wildcards in both hierarchy name and instance name. For example, there are four hierarchical instances u_lane0, u_lane1, u_lane_2, u_lane3, each instance has spare modules with instance naming ‘u_spare*’, and in each spare module AND gate has instance naming ‘*AND*’. In order to find all spare AND gates, one can enter a string ‘u_lane*/u_spare*/*AND*’. This command pops up a window for user to enter a string into the entry to load the matching instances onto the schematic. Same as ‘List Gate’ command above, it accepts wildcards. However, the total number of gates drown on the schematic should not exceed the threshold defined in Menu Options->Setup->Misc->’Gates number limit’. This command pops up a window for user to enter a string into the entry as the net name. The tool finds the driver of the net and draw the driver on the schematic. Use mouse-left-button to select a bunch of objects (Instances or wires) on the schematic. Click this command to list all the selected instances’ full hierarchical names in a pop window. Use mouse-left-button to select a bunch of objects (Instances or wires) on the schematic. Click this command to list all the selected wires’ full hierarchical names in a pop window. Use mouse-left-button to select a bunch of objects (Instances or wires) on the schematic. Click this command to list all the selected gates’ module name in a pop window. Use mouse-left-button to select a bunch of objects (Instances or wires) on the schematic. Click this command to list all the selected instances’ full definitions in a pop window. Use mouse-left-button to select a bunch of objects (Instances or wires) on the schematic. Click this command to list logic type numbers of all the selected gates in pop window. For example, ‘AND’ gate has type ‘and’, inverter has type ‘not’. The pop window can have information such as “Type ‘not’ has 11”. This command can zoom in the schematic view. The maximum zoom in ratio is 100%. Keyboard shortcut for this command is key ‘+’. This command can zoom out the schematic view. The minimum zoom out ratio is 13%. Key board shortcut for this command is key ‘-‘. This command can directly select zoom ratio, the valid values are 100%, 67%, 44%, 30%, 20% and 13%. This command pops up a window for users to enter a string to find the matching instances on the schematic. It matches portion of the full name. For example, ‘U’ matches ‘U0’, ‘U1’ and ‘U222’. This command pops up a window for users to enter a string to find the matching wires on the schematic. It matches portion of the full name. For example, ‘Net0’ matches ‘Net0’, ‘Net011’ and ‘Net023’. This command is to undo schematic operations. Keyboard shortcut is Ctrl-z. This command group is to automatically place the gates on the schematic and automatically route the wires. This command is to do both placement and routing automatically. This command is to do automatic placement only. This command is to do automatic routing only. This command is to reset all existing routes, all routed wires become straight. This command is to create Postscript file or PDF file for the current view of the schematic. In Windows platform, only Postscript is support. On Linux platform both Postscript and PDF are supported. This command launches layout viewer window. If some gates and wires are selected on the schematic, they are highlighted on the layout viewer. It requires DEF and LEF physical design files to be loaded. This command is to load layout physical design files. They include DEF and LEF files. The command can be run several times to load the physical design file one by one. DEF and LEF files can be loaded by command line with -def and -lef options. Or they can be read in by API 'read_def' and 'read_lef' in GofCall script. This command launches GofCall Script Interface window. This command group handles spare cells in automatic metal ECO flow. This command creates spare cells file. This command loads the spare cells file created by the command above. This command launches netlist files compare window. This command launches Prime Time report file processing controller. This command group handles SDF loading. This command creates SDF file index file. GVT doesn’t load the full SDF file, but SDF index file instead. This command loads SDF index file created by the command above. This command increases the font size on the schematic. This command decreases the font size on the schematic. This option makes port name visible. This option makes wire name visible. This option makes gate title visible. This option makes gate type visible. This option makes wires visible. This option makes comments visible. This command pops up a window to setup simulation waveform restore file. Four waveform restore file formats are supported. If one or more of the formats are selected, GofViewer and GofTrace pop menus have ‘Write Selected Nets to the Waveform Restore File’ as the first item, when a net is selected. This option enables saving string to clipboard when a wire or instance name is clicked by mouse-left-button. This is normal mode of the schematic tracing. This mode sets cursor in editing wire connections mode. Press mouse-left-button on the straight wire connection and move, the line is pulled by the cursor until the mouse button is released. The command pops up configuration window for the tool setup. About Gates On the Fly. Visit the website for the manual. Click mouse-left-button on the schematic window, the object which can be net, instance under the cursor is highlighted. GofTrace pop menu has different content according to the selection status. Pressing keys Ctrl-a can have all selected on the schematic. Press mouse-left-button on empty space, and don’t release, move mouse down to select multiple objects. 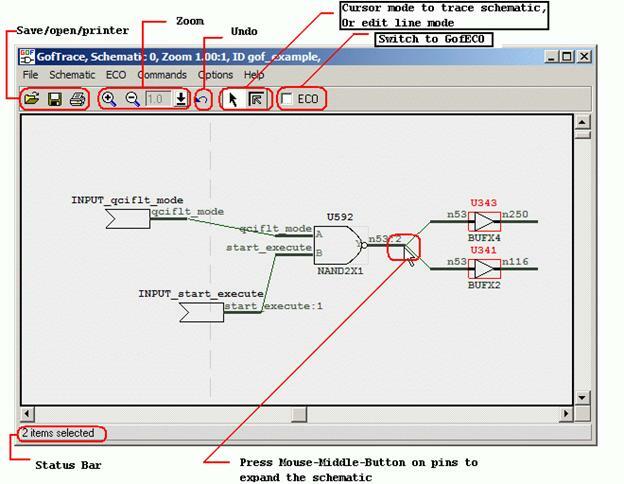 Click mouse-right-button on GofTrace schematic, a menu pops up. The content of the menu varies as the selection status on the schematic. Trace driver of an input pin. If the driver is a buffer or invert, the tracing will continue on the input pin of the buffer or invert, until the driver is non-buffer/invert. The feature can be used to trace the clock tree cells of a flop's clock input. Logic Cone is the logic cluster between flops and ports, as shown in the following figure. Users should select the output flop or its pins to do logic cone extraction. Draw the whole logic cone on the schematic. Display the whole logic cone in a pop up text window. This command group does interactions between GofTrace windows and LayoutViewer windows. Copy the selected items to a new schematic. Copy the selected items to an existing schematic identified by ID Number. Copy the selected items to a new launched LayoutViewer window. The selected circuit is marked on the LayoutViewer window. Copy the selected items to an existing LayoutViewer window indentified by ID Number. The command needs Reference Netlist loaded. Use mouse-left-button to select on a pin in implementation netlist and press 'ctrl' key to click mouse-left-button on the other pin in reference netlist. So that one pin in implementation netlist and the other comparing pin in reference netlist are selected at the same time. Click mouse-right-button to popup menu and select "Equivalence Check for 'neta' vs 'netb'" command. When the check is done, a pop window shows if the nets are equivalent. Wire names in RTL codes are normally optimized away in synthesis process. GVT has a way to retrieve them. A reference netlist with the wire names preserved should be synthesized. There are several ways to preserve wire names. Reference Netlist should be loaded with Implementation Netlist. Reference Netlist can be loaded by '-ref' option in command line. For example, "gvt -lib tsmc.lib implementation.v -ref reference.v"
Start GUI Window, load the preserved wires on a schematic window. Select the pin that drives the wire, right click mouse-right-button to popup menu. 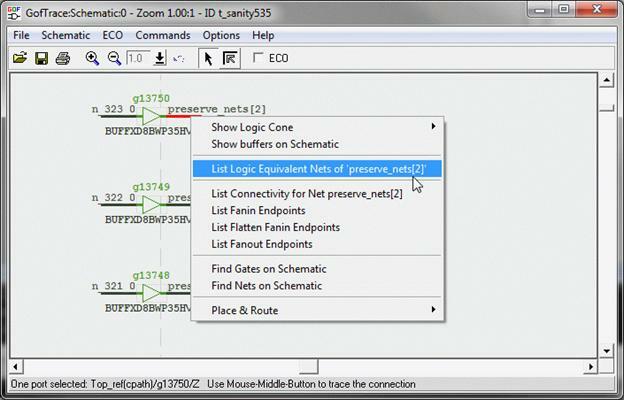 Select 'List Logic Equivalent Nets of …' command. A popup window appears to list the nets that Logically Equal or Invert to the reference net. By popup menu on the window, the corresponding nets can be easily loaded into the schematic. The feature is very convenient in manual ECO when the optimized wires have to be located in Implementation Netlist. When two or more than two instances are selected on the schematic, the command item appears in the pop menu. This command finds the combination logic path between two instances. This command adds comments entered by users on the schematic. This command finds the selected instance back in GofViewer netlist window, and highlights the instance in the netlist window. This command pops up a window for users to add or change comments associated with the gate and change the color of the gate. This command pops up a text window to list the logic of the selected leaf cell. This command pops up a text window to list the library content of the selected leaf cell. The content includes the cell’s pin definitions, area and timing. This command pops up a text window to list the instantiation of the selected instance. This command pops up an entry window with the current selected instance name pasted in the entry. So that user can do simple change to load other similar naming style instance onto the schematic. This command changes the selected gate symbol display to the equivalent symbol according to DeMorgan's Laws. For example, NAND symbol is equivalent to Inputs Inverted OR symbol. This command deletes the selected objects on the schematic. The object can be gates, wires and comments. GofECO uses the same window as GofTrace by enable ECO mode. The background color changes to light blue by default. The color can be configured by Menu Setup->GofECO->Color->BackGround. The ECO operation icons appear on the tool bar. GofECO uses the same menus GofTrace uses, besides the contents in ECO menu being activated. 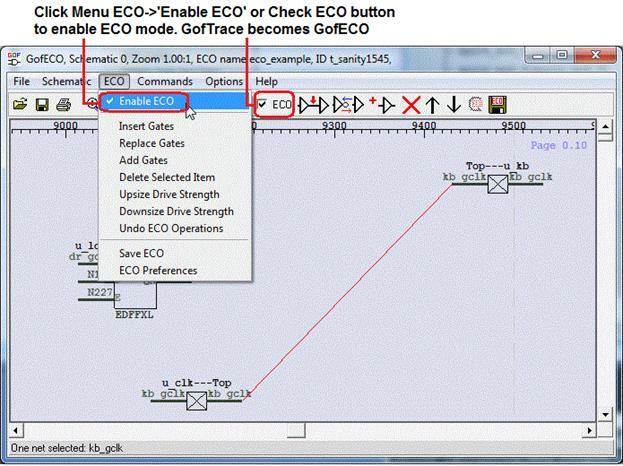 This option enable ECO mode, GofTrace switches to GofECO. A pop up window appears for inputting ECO setups. Use Spares Only' is to use spare type gates only, a spare gate list file must be loaded with this option enabled. Map Spare Gates' is to let the tool mapping any type gates to either the spare type gates or the exact spare instances in the design. Buffer Distance' entry is to tell the tool add buffers/repeaters when the connection distance is larger than the limit. Inputting a large number can disable adding buffers. The corresponding script command is 'set_buffer_distance'. This command inserts gates in the selected wires. It requires one or more wires being selected on the schematic, before inserting gates. A ‘Gate selection’ window pops up for users to select proper type of gates and gate number. When multiple wires are selected and some wires have the same drivers, users can choose either one gate driving all shared wires or one gate driving each wire. Users are asked to choose the pin connections in ‘Specify pin connections’ window. The default pin connections setup can be used and users can modify the connections later on the schematic. Read this PDF use case for more detail. This command replaces the selected gates with a different type of gates. It requires one or more gates being selected on the schematic. If two or more than two gates are selected, they should have the same type. A ‘Gate selection’ window pops up for users to select proper type of gates to replace the selected ones. Users are asked to choose the pins connections in ‘Specify pin connections’ window. The default pin connections setup can be used and users can modify the connections later on the schematic. This command adds new ECO gates on the schematic. A ‘Gate selection’ window pops up for users to select proper type of gate to add onto the schematic. The new ECO gates appear as output driving a new net and input floating. The hierarchy of the gate is undefined. When users connect one of the input pins to another existing gate or connect other gate’s floating input to the ECO gate’s output pin, the ECO gate gets the same hierarchy as the other gate. Read Add Connection for more detail. This command deletes the selected items. Users would be warned for deleting multiply objects at the same time. This command upsizes the selected gate to a higher drive strength gate with the same type. If there is no higher drive strength gate available, users would be warned with a pop up information window. This command downsizes the select gate to a lower drive strength gate with the same type. If there is no lower drive strength gate available, users would be warned with a pop up information window. This command undoes the previous ECO operation, until no more ECO operation is in the pipeline. There is no operation button/icon for Add Connection operation. Adding connection can only be done from a floating input pin to a output pin. User can press mouse-middle-button on a floating input pin, and don't release the mouse. Then move mouse to the destination output pin of the instance that user would like the wire connected to, release the button to make the connection to be created. Metal ECO only touches metal layers. Gates On the Fly provides four Metal Only ECO modes by combinations of setting up the options in ECO preference and loading DEF file. User can add any type of gates and let the tool map to the spare type gates, Place and Route tool should map the spare type gates to the exact spare gate instances. Spare gate list file should be created and loaded. DEF file should NOT be loaded. 'Use Spares Only' is NOT checked. 'Map Spare Gates' is checked. User can add any type of gates and let the tool map to the exact physically existing spare gate instances. DEF file should be loaded. User can add only spare type gates and let the tool map to the exact spare gate instances. 'Use Spares Only' is checked. User can pick the exact spare gate instances, and connect and disconnect up the instances in ECO. Spare gate list file has no need to be created and loaded. 'Map Spare Gates' is NOT checked. LayoutViewer window displays partial physical placements. The circuit drawn on the schematic can be highlighted on LayoutViewer. It has full interactivity with GofTrace. It requires physical design files including DEF and LEF files to be loaded. This command captures the current LayoutViewer display to PDF file. PDF is only supported in Linux Platform. In Windows Platform, the captured display is saved in PostScript format. Clear circuit markers which can be created by Drag-And-Drop from GofTrace Partial Schematic. Clear search markers which are those highlighted cells matching the searching string in search entry. When cells or markers are selected in LayoutViewer, this command can launch a schematic with selected instances on it. This option shows grid on LayoutViewer. This option shows instance name on LayoutViewer. Zoom in scale should be large enough to show instance names. This option shows module name on LayoutViewer. Zoom in scale should be large enough to show module names. 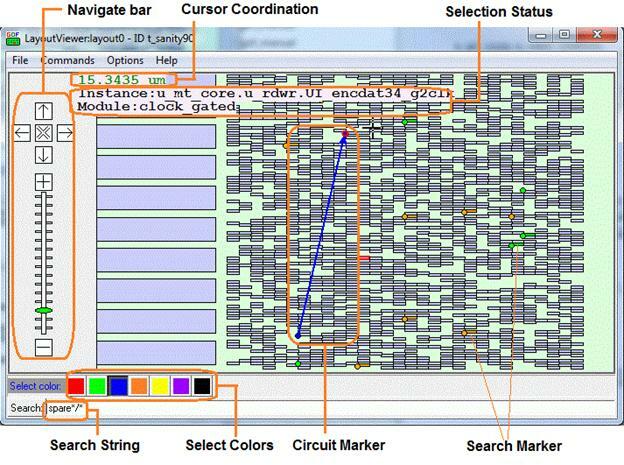 LayoutViewer setups which include maximum search matching number and placement display zone area size. Visit NanDigits web site for Gates On the Fly manual section LayoutViewer. Click mouse-right-button to pop up the menu. Clear circuit markers which can be created by Drag-And-Drop from GofTrace Partial Schematic . This command clears searching markers which were activated by search function. Press 'Ctrl' key and move mouse, the Cursor Coordination displays the length cursor moves in unit of 'um'. Press 'Shift' key and press mouse-left-button, move mouse to draw a virtual rectangle. When release the mouse-left-button, those markers in the virtual rectangle are all highlighted. Click mouse-right-button to pop menu, those selected instances can be sent to other schematics or GofViewer the netlist view window by 'Copy Selected to' command. Mouse-middle-wheel: Roll up to zoom in and roll down to zoom out the LayoutViewer window. Mouse-left-button: Click and release to select cells or markers. Press on LayoutViewer window to move it around. Mouse-right-button: Release to pop up menu. Click color buttons in 'Select color:' bar to select the current color. 'Select Color:' string changes to the current selected color. Any new Circuit Markers and Search Markers have this color. Type search string in Search Entry to highlight the leaf instances matching the string on the LayoutViewer. The search string is in 'path/instance' string format, separated by '/'. Wildcard can be used in path and instance names. The markers have the color selected in 'Select color' bar. -spare: When spare gate list is loaded by -sparelist option or get_spare_cells command. -type type-name: Only search those instances with specified type, 'nand' for example. -hier: Search all leaf instances under the specified hierarchy. For example, 'u_clk/* -hier'. -ref ref-name: Only search those instances with specified reference, 'NAND2X2' for example. 'u_rtc/*' : Search leaf instances in hierarchy 'u_rtc'. '* -hier -type nand': Search all leaf instances with 'nand' type in the design. 'u_clk/* -hier': Search all leaf in hierarchy 'u_clk' and its sub-hierarchies. GofCall is the Perl Script Interface which can access internal exported APIs. Type 'help' in interactive shell 'GVT >' to list all APIs. Type 'help individual-API' to list detail of the API. Visit https://nandigits.com/gof_manual.htm for online manual. Automatic ECO with fix_design/fix_modules APIs. Rich ECO APIs to do manual ECO. ECO result can be loaded in schematic on the fly. fix_hold: ECO command. Fix hold time violations. fix_setup: ECO command. Fix Setup time violations. swap_inst: ECO command. Swap two instances with same input/output pins. One key element to do efficient manual ECO is to isolate the ECO spots quickly. The following APIs are for fast Netlist Browsing. After the script is run, @flop_data_pins have all data pins of all flops in the module. Combining netlist browsing APIs, users can come up a short script to do complicated changes. For example, to fix all modules named "tx_machine_*"
These APIs are for reading/writing files. write_perl: ECO command. Write out GofCall ECO script compatible with Perl. These are APIs for Manual ECO. change_gate: ECO command. Modify an instance in ECO. change_pin: ECO command. Modify pin connection in ECO. Combining netlist browsing APIs, a short GofCall script can do very efficient ECOs. For example, to add isolation cells for all output ports of a module. For individual API, type '#' followed by API_name. Instance with backslash should be either put in single quote and with a space in the end, or removed the backslash and let the tool to figure out the real name. In command line, the GofCall Script can be run by ‘-run’ option. If '-run' option is present in the command line, and 'gexit' is not in the script, or GVT meets error when executing the script, GVT goes to interactive mode with GVT shell 'GVT >'. GofCall scripts can be run in GUI window. In GofViewer, click Menu Commands->’Launch GofCall Script Interface’ to launch GofCall GUI window. In GVT shell, GUI windows can be launched by 'start_gui' or 'sch' commands. 'start_gui' launches netlist view window first and user can bring up schematic window from netlist view window. 'sch' command only launches schematic window, and it doesn't enable netlist view window. So it has fast turnaround in GUI interactive debug. 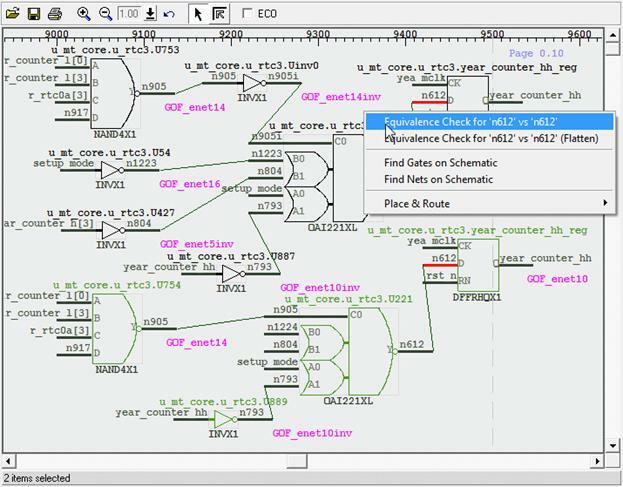 The instance is loaded into a schematic and user can click on the instance's pins to trace fanin/fanout on the schematic to see if the ECO is done as expected. 'sch' fast schematic launch command can be used as break points for debug. For example, 'sch' commands are inserted in GofCall script, when the tool runs to the point, a schematic is launched. On the schematic, user can use mouse-middle-button clicking on the pin 'D' to see if the ECO is done as expected. Note: 'ECO' check-button is enabled automatically, since there is ECO having been done. To compare with the logic before ECO, launch a new schematic by menu Schematic->'New Schematic'. On the new schematic, press 'ctrl-g' or by menu Schematic->'Load Gate' to load in the flop under ECO. Note: 'ECO' check-button is un-checked. # AND all output pins with "power_on" signal. if the design has more than one netlist files. Provides liberty file (technology library). if the design has more than one technology library files. for leaf gates, like AND2X4. There can be multiple -v options, if the design has more than one simulation library. in the beginning of ECO netlist. And the ECO cell is added as a hierarchical sub-block. Provides ECO script name. The script is compatible with Perl syntax. GVT stays in shell mode when the script finishes. 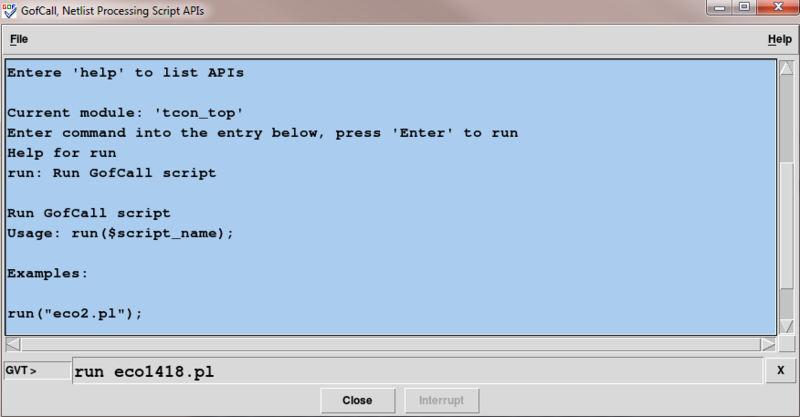 Runs in text mode with shell prompt, GofCall APIs can be run in interactive mode in shell. Specifies log file name, default gatesof.log. side of GofViewer window. -Top_2 -Top_3 ... can be used to load more netlist files. will create two trees in the left side of GofViewer window. the main tree is gone. Specifies design name. The name appears on GUI Window tile bar. Specifies DEF file (Design Exchange Format). if the design has more than one def files. Reports all def error, otherwise only first 10 are reported. Specifies Library Exchange Format file. if the design has more than one lef files. Specifies spare cells list file. Define parallel processing CPU Core number. Set the number to zero to disable parallel processing. By default, the tool picks a optimal number according to the host CPU setting. Prints out current version and exits. Loads analog cells in verilog library file analog_models.v all analog cells are black boxes. Loads Design Exchange Format file soc.def.gz. And library exchange format file for layout view usage. Loads VCD file for schematic annotation. Loads both implementation netlist and reference netlist, can be used in netlist comparison.